After many requests and lots of diliberations I’ve decided to post my own top 20 European brands. Top 20 European kitchen companies, because I simply felt that there are too many great European kitchen brands to limit the list to just top 10. DESIGN – overall product design, esthetics and selection depth (colors, materials, design elements, etc.). PRODUCT INNOVATION – is this a kitchen brand that takes risks, that is on the cutting edge of technology and innovates or just a company that copies others? PRODUCT QUALITY – how well made is the product? Does the company ‘cuts corners’? SERVICE – delivery on time, delivers complete orders, ‘after sale’ service, etc. I have chosen not to take into consideration COMPANY SIZE, as there is no real direct benefit to the buyer and I’ve already listed the 10 largest European brands. I also did not factor VALUE because I feel that value is very individual – what one consumer sees as a great value, another may view as cheap. Webster’s definition of Value is – “a fair return or equivalent in goods, services, or money for something exchanged”. Once a kitchen brand has top design, innovation, quality and service, the price will always be higher. Surprizingly, there are a few kitchen brands on this list that have a pretty good value, as well as ranking high on all the other categories. In the Top 20 European Kitchen 11 Italian kitchen brands, 7 German kitchen companies, one English and one French are in the above list. Clive Christian – ranked high on DESIGN and if marketing was a category, will most definitely be included in the Top 20 list. Marchi – ranked very high on DESIGN and INNOVATION. Minotti – one of the best in creating the very unique, minimalist and clean look, that goes beyond a kitchen design. Not for everyone and is available only in selected few locations worldwide but Minotti is at the top of the DESIGN category. LaCornue – though they are really more of an appliance company (ranges, cook tops, etc.) , they do offer cabinets and other elements that allow them to complete a kitchen. Very unique DESIGN, perhaps a trend setter in the high end appliance arena, with HIGH QUALITY products. am confused between arclinea and hacker kitchen, which one do you recommend for the quality? I don’t mind about the price that much. Hi, for an all out greatlooking,sturdy,durable,well made kitchen in what order would you recommend Haecker, Pedini, Varenna, siematic and Modulnova? THANKS KITCHENGUY. WHEN IT COMES TO VALUE 4 MONEY, OF THE 5 BRANDS THAT I MENTIONED ARE THEY ARE ALL THE SAME OR DOES ONE STAND OUT? IS THE CARCASS QUALITY OF THE SAME 5 BRANDS THE SAME OR DOES ONE STAND OUT? dawn – Haecker & Pedini also offer value models, so that may be what you’re looking for. Carcass is similar. 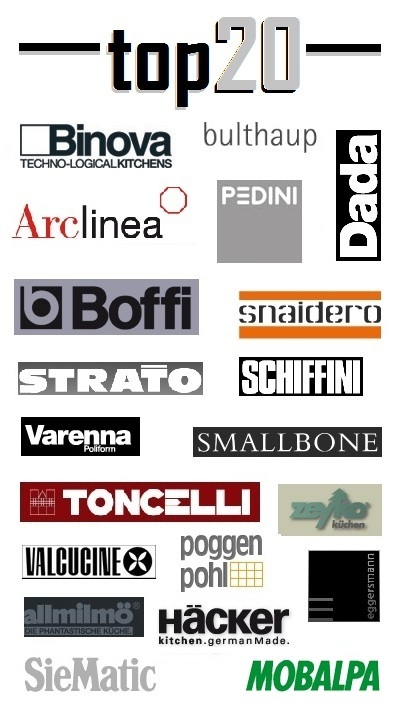 Hi kiTchenguy…I’ve been shuttling between nobilia and Schuller showrooms and now I’m in a fix which one to go for. For almost the same price I’m offered a group 6 quality from shuller and a group 3 from nobilia( shuller being $500/- more expensive)….your expert advice on the over all workmanship of both shuller and nobilia and also the cabinet quality and other fittings is highly appreciated. Ammar – go with the designer/store that you like better. There’s little to no difference in the products. Additionally, have you heard of GeD Cucine ? if so, would you say its nearer IKEA or EGGERSMANN in quality ? Or maybe somewhere in the middle? Hi , we’43 doing a kitchen remodel. Between Arclinea and Stosa what would you pick ? The Arclinea is coming out aboiyt 10% more expensive. Thanks! Bettina – that’s an easy one – Arclinea. I am wondering if you are familiar with HOME Cucine in Italy, very good models and prices. Are you familiar with their quality? Also what do you think of ALNO and wellmann please? German. Hi Kitchenguy, We are in between a veneta and a modulnova kitchen. Quality wise which direction do you suggest we should take? How would you rate them?. Thank you! We’re buying a kitchen for our new home. We’ve seen Arrex, Varenna, SCIC, Modulnova, Record and Miton. We’re choosing same materials but would like to base our decision on quality over price. Can you pls rate them in terms of their material quality. Thanks, great website. We have to make a decision on our new kitchen. We are stuck between Schuller being cheapest then Next 125 and Leicht (similar price) all with Meile appliances. Which one would you recomend quality and brand. Susan – all of them are good products. Go with the designer/store you fell most comfortable with. Susan Jormark – too omuch info for a quick answer (sorry – too many to respond to). Where is “your city”? Hi! Well done for this great blog! We are undecided between Nobilia,Veneta or Stosa. What do you think especially as regards to quality? Thanks and keep up the good work! Jon – from these 3 I’d go with Leicht. I am looking for a new kitchen and I got a quote from Nobilia for cheaper option about 28K and more expensive 35K. I like their design but after reading things on your blog it seems a bit expensive. I also got a quote from a carpenter about 25k. Elle – there are many other, better brands, that have a more basic, entry-level lines that will price like this or better. How you rate dada kitchen vs binova kitchen? Jan323 – both are great products. When it comes to pull out units and corner units, do you prefer chrome or powdercoated ones? Now that Alno AG have filed for insolvency, where do you think the company is going with it’s various brands; Alno, Wellman, Pino, Piatti and Alnoinox. Is it just matter of restructuring and will re position itself as a major player in the kitchen business or expected to close down. Hi Kitchenguy, first of all, thanks for the invaluable insights. We’re in the NY area and have narrowed down our selection to Bulthaup, Valcucine, Boffi, Dada, Eggersmann, and Minimal. What do you think are the pros/cons on each in terms of quality and design flexibility , especially regarding Eggersmann and Minimal (can’t seem to find much info on them)? And the genera cost, most to least? Thanks in advance for your time! Where does Cesar fall on the quality scale? It’s not on your list so assume it’s not in the top range? Can you name any brands that are comparable? Hey kitchenguy, We are debating between Arclinea and Pedini. Which do you prefer and why? Thank you. We’re debating between Leicht and Snaidero for our kitchen cabinetry. Since you don’t have Leicht on your top 20 list, I’m going to guess you’d recommend Snaidero. If it’s not too much bother, what are the advantages of Snaidero over Leicht … or, if it’s easier, what do you view are Leicht’s disadvantages? We’re about to spend £60k on a Bulthaup kitchen, I’m really nervous to do so but my husband has been totally sold – do you have any advice? Is there an less expensive brand offering a similar style and the same quality or are they worth it? I’m looking into three different brands, Leicht, Arrital and Porcelanosa, I liked the first the best, but the price was a little out of my reach. The quotes came back in the order listed. What is your recommendation for best value? Do you have any concerns about the quality of the other two brands.